Entitled "Train," the 70-foot sculpture would also spin its wheels, blow a horn and emit steam. "We’ve had a crush on the ‘Train’ for a while now,” Robert Hammond, one of the founders of Friends of the High Line, told The New York Times. “To me, it looks very industrial and sculptural. The craftsmanship that went into these industrial engines is quite beautiful." And Koons himself said in a statement, "The power and the dynamic of Train represents the ephemeral energy that runs through the city every day," said Jeff Koons. Of course, now the Friends of The High Line just have to find someone to pay for it. Hammond and co-Friends founder Joshua David are in search of a donor willing to dish out $25 million to complete the sculpture, which will weigh several tons, and incorporate it with the last phase of the park -- a half-mile stretch that runs along the West Side rail yards and north to 34th Street (see photos below). "Our top priority is to build and open the rail yards section of the High Line. In order for this idea to become a reality, we would need to determine a way to safely integrate Train into the rail yards design, and find private support from a single funder to build it," Robert Hammond said. 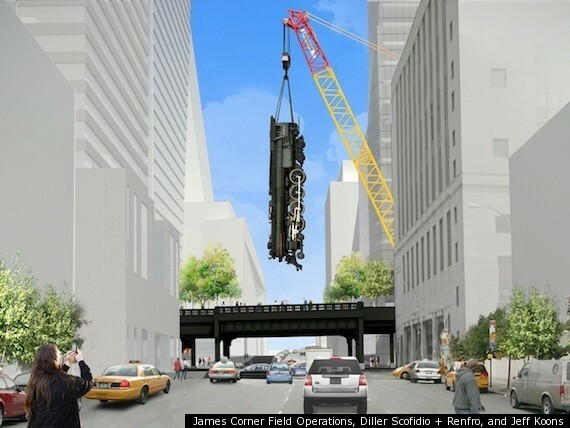 "Train" could also end up at the Los Angeles County Museum of Art, but Koons and the museum have indicated their support for installing Train at the High Line. For another glimpse of what "Train" might look like, check out the video below.